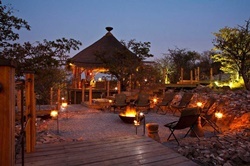 from/to Windhoek covering some of the most beautiful lodges available for a honeymoon feeling. Arrival at Windhoek's Hosea Kutako International Airport. 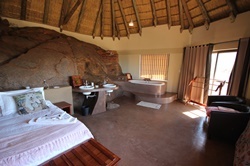 Here you take over your rental vehicle or meet your guide and proceed to your first accommodation situated close to Windhoek high above the Namib Plains, just before the well-known Spreetshoogte Pass. catering you can choose whether you want the complete solitude and cook for yourself or whether you have yourself spoilt by dining at the lodges main building. I am sure you would want it to be an ice cold evening or two so that you can light a cozy fire in the fireplace and snuggle up in bed with some romantic music, a good book or better things to do. After a relaxed, sumptuous breakfast you continue into the heart of the desert, stopping over at the foot of a petrified dune, not too far away from the legendary Sossusvlei, Dead Vlei and Sesriem Canyon. 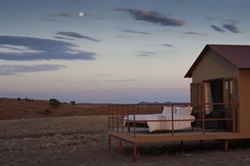 On your way to your first nights’ accommodation you can enjoy the stunning view over the desert plains from Spreetshoogte pass, hoping that the air is clear, and then stop over for the best apple crumble in Namibia served at the bakery in Solitaire. Since your drive is not too long you can join the lodge on a nature drive through the desert landscape admiring the beauty of your surrounding. The following morning you can plan for a visit to Sossusvlei, Dead Vlei and Sesriem Canyon. Should you want to see the color play on the dunes, this will mean a very early start of the day. Returning from your excursion you move to a camp in solitude where you can sleep under the stars, which will never again shine so intense for you, than they do in the desert. 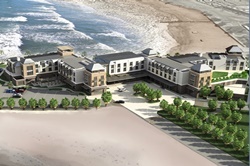 A brand new hotel on the beaches of Swakopmund is our next destination. Driving via the Ghaub- and Kuiseb Pass you reach Walvis Bay and continue along the coastal road until you reach Swakopmund. Enjoy a spoilt stay in Namibia’s most sought after holiday resort, walk the beaches with your love, enjoy delicious meals with stunning ambience, ideal for some romantic evening and join either a dolphin and seal cruise or a Living Desert Adventure. A villa situated on the cliffs with a view into the Damaraland with a private chef and dining if you like. What more would you want to make this trip special? Visit Namibia’s first world heritage site, the organ pipes, petrified forest and if you like the Living Museum of the Damara. Enjoy the peace and tranquility of your accommodation and have your senses float into the open space. From here you can extend towards the north and the Epupa Falls or do a fly in safari into the Skeleton Coast. 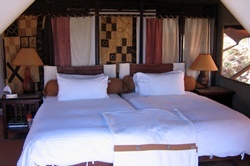 Another highlight is waiting for you, the youngest addition of the Etosha National Park accommodation. No fences keep the wild animals out you might even be able to see them while on your way in a golf cart to dinner, or have them roaring in front of your bungalow during the night. Surely no destination to sleep outside on the patio. Enjoy the day’s game driving in the park, whether alone or on a guided drive and relax amidst wildlife in the evenings and at night. Have you ever spent the nights in a Treehouse. Well if not you are surely in for the first experience of this sort. Spend the evening’s game viewing from your treehouse to the close by waterhole while lying in bed and making yourself comfortable. 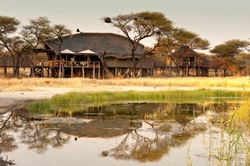 During the days explore the eastern side of Etosha National Park and find the game you have not yet seen during your stay in the west. A final night in Namibia before you depart either home or into another direction of Africa for instance Botswana or even Mozambique for some beach holiday. 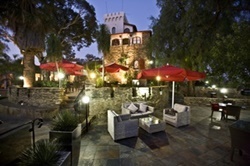 This night you will spend in a hotel high above Windhoek overlooking large parts of town enjoying a splendid meal in luxurious ambience. Well in time for your outbound flight you return to Windhoek International airport. Hand in your rental vehicle and bid farewell to your honeymoon destination.